Jan's Writing Journal: "Making Music At The Bank Of America"
I read the book ( WHO has my copy?) and I saw the film ( Nicholas Cage boogeying in the bougainvillea with Penelope Cruz) and there's probably a T-shirt but I haven't got it.
" 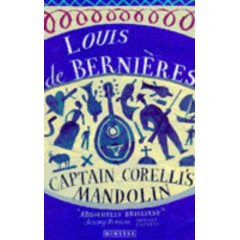 Captain Corelli's Mandolin"** was one of the publishing success stories of the '90's; it was Louis de Bernieres' 4th novel, published in 1994. It promises to be a superb evening: "Music and Poetry for Autumn" with Ilone Antonius, flautist, and the Antonius Players. They've appeared at the Edinburgh Festival and their repetoire ranges from Keats to Eva Cassidy, Shakespeare to Seamus Heaney. Should be a very gooood night. ** " Captain Corelli's Mandolin" available from www.amazon.co.uk/ and lots of good book shops. AND PS: Exactly a year ago today, I started my blog, so Happy Birthday, Blog! It's been fun. Look forward to hearing how it went. I love that book too. In fact, lots on your 'tagging' list resonated with me - the Flopsy Bunnies is my favourite Beatrix Potter; love Little Women and Cats Eyes too - huge Margaret Atwood fan - and Wuthering Heights, of course. Also - doing a bit of a catch up - I took my children to Grizedale forest last year. THey loved the sculptures. Will get round to doing my 5 books at some point, promise! Sounds like a wonderful evening in store for you Jan. I'm sure you'll enjoy it. Who said it all happens in Melbourne Australia! Sounds like there's heaps going on in your neck of the woods too. How exciting to see Louis De Bernieres playing his mandolin. Happy birthday too for your blog. About your copy of Captain Corelli's Mandolin... I had it but it fell apart on holiday! It was in Greece though so it felt quite apt. Like me, it couldn't quite deal with the heat! Boogeying in the bougainvillea and birthday to boot! Happy day. Have a great evening. I enjoyed Captain Corelli too. Happy anniversary! hope it was a good night. I love the sound of the mandolin. I still can't forgive the filmmakers for what they did to that book! Happy Bloggiversary from me too. I love the confession from your son! And Kate Ford, eh? Yes, I watch "Corrie". We appear to have something in common here! Quite a surprise in many ways; enjoyable and relaxing and a light hearted intro to the festival.. But it couldn't have ended its life in a more suitable place, could it? Trust you Marly to notice that! I'm all for the odd spot of alliteration..
That's often the story, isn't it,with books into films. I'm looking forward to seeing " Atonement"
I wonder whose seen it already? Hmm. He says he reads my blog and now I know he REALLY does! !